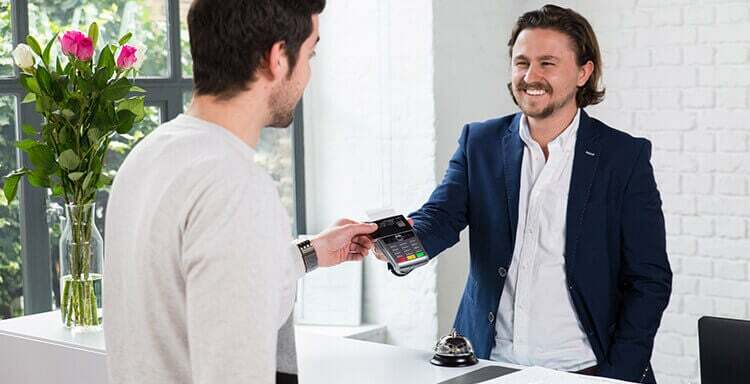 A merchant account is a type of bank account that lets your business accept secure credit and debit card payments – in-store, online, or over the phone. Some people make the mistake of confusing a merchant account with a regular business bank account. They are two totally different things. Without a merchant account your business won’t be able to process card payments. Which makes merchant accounts essential if your business is hoping to grow. Piqued your interest? Thought so. Let’s find out how they work. Step 1: Jane orders a coffee. Jane is served a coffee. Jane pays for her coffee by touching her contactless card to the card reader. Step 2: Jane’s card details are sent from the card reader to the merchant account, held with an ‘acquiring bank’, along with details of the transaction. The acquiring bank routes this information to the relevant card association — either Visa, Mastercard or Discover. Jane has Visa. Step 3: Visa forwards the transaction details to Jane’s bank — known as the ‘issuing bank’ — to see if Jane has enough money in her account to pay for the coffee. Step 4: Jane just got paid, so she has more than enough money. The issuing bank fires back a response to the acquiring bank, via the card association, which transmits the information to the card reader: “Transaction Approved”. Jane enjoys her coffee. So you can think of a merchant account as a kind of holding-pen — a secure place for funds to sit while the bank checks to make sure the customer has enough money in their account to make payment. In 2016/2017 the UK generated the highest revenue in cashless payments in the European Union – £81.3 trillion (€90.9 trillion). Card machines are usually rented from merchant service providers as part of your merchant account agreement. Choose from countertop, wireless and mobile card reader models. An online merchant account, sometimes called an internet merchant account (IMA), comes equipped with a ‘payment gateway’. Linked to the checkout feature of a website, a payment gateway stores and transmits customers’ payment details to the merchant bank securely. To take card payments over the phone you’ll need a dedicated mail order/telephone order (MOTO) merchant account, complete with ‘virtual terminal’. A virtual terminal is essentially just a secure webpage you can access from your browser. You just log in, enter your customer’s card details, and take the payment. How much does it cost to get a merchant account? Merchant account fees vary based on the volume of card transactions processed. Essentially, the more money you take from card payments annually, the lower the rates offered to you by providers. Core charges fall in to two categories: monthly charges and charges per transaction. Providers are often reluctant to offer up a full list of charges in their initial quote, so be sure to ask about all nine listed below. There’s another monthly fee for you to factor in, and it’s an important one so warrants going into a bit more detail. That fee is: PCI compliance. PCI compliance is a legal requirement for all businesses that process card transactions. It’s basically a series of checks to make sure you’re handling sensitive data in a responsible manner. For a small fee, merchant account providers offer a PCI compliance service — and we recommend you take it. Honestly, it’s not worth the hassle of trying to do it yourself. Key takeaway: Pay a little up-front to avoid a hefty fine. Chargeback isn’t something to worry too much about — unless you’re doing shady business. It’s a measure designed to protect the consumer. If a consumer suspects that a transaction on their account is fraudulent, they are entitled to challenge it with the bank. If the challenge is upheld, the money will be refunded and the merchant will incur a chargeback fee. It’s basically a charge for wasting the bank’s time. Key takeaway: Expect to pay £15 for every successful chargeback claim against your business. Like chargeback, interchange isn’t anything to lose sleep over — but it’s worth understanding so you can impress your friends down the pub. It’s a mandatory fee paid by the merchant’s bank to the customer’s bank, and forms a portion rates — discount rates, to use their proper name — charged by your merchant account provider. Interchange is capped at 0.2% of the transaction for debit cards and 0.3% for credit cards. Key takeaway: Interchange fees are non-negotiable — they’re set in stone by the card processing companies. Don’t believe any merchant account provider that claims otherwise. People tend to spend more money when paying by card. We all know the feeling. When you’re not physically counting pounds and pennies onto the counter, it’s easy to feel like you’re not spending at all. So enabling your customers to pay with a tap is a great way to keep them spending, and keep them satisfied. Contactless card limits vary hugely across the world. In the UK, the cap is set at just £30 whereas in Japan and China, people can pay over £100 through contactless card transactions. Accepting card payments means… less cash to deal with! Which also means less chance of your staff giving incorrect change, or lining their own pockets at your expense. And having your earnings in a bank account – and not in piles of cash lying around at your premises overnight – is always going to be good for your peace of mind. Accepting card payments cuts out any chance of you accidentally accepting counterfeit banknotes. All credit and debit card payments go through a secure payment gateway provider for authorisation. Which means you’ll know immediately if a customer’s payment hasn’t gone through. Credit and debit cards are the payment method of choice for customers in most situations. People just… don’t carry cash anymore! This is most true for tech-savvy millennials – 46% of whom are put off from buying at cash-only businesses. Plus, there’s no excuses not to be taking card payments. Processing a contactless transaction is quick and easy. So quick, in fact, that it takes longer to pay with cash! Relieve your staff of the burden of counting out change in front of a queue of customers. Speed up service and stay with the times. Paradoxical we know, but…with less cash to deposit, you can actually save on bank fees. Many banks charge businesses depositing large amounts of cash and cheques through the roof. Though merchant accounts also come with fees, these could be lower than the ones you’re already paying. An aggregated merchant account is a service offered by a payment facilitator (PF), and is often the best choice of merchant account for small business. A PF recruits merchants on behalf of the acquiring bank. They are basically re-sellers — like a travel agent who sets you up with a hotel and takes a tidy cut of the room fee as payment. When you sign up, your business is given a code based on industry and type of goods sold. Similar businesses are then grouped together in shared pools. By pooling transactions from multiple merchants together and channeling them to the acquiring bank to be processed in one jumbo, shared merchant account, PFs can negotiate the same low rates for small to medium-sized businesses available to larger enterprises. The downside of an aggregated merchant account is that you have less control over when your money is paid to you. Plus, for some businesses, it may be the case that they’re able to negotiate better rates with a dedicated merchant account. A dedicated merchant account is set up directly with the acquiring bank. It offers greater control over when your money is paid to you, and allows you to negotiate rates specific to your business. Some businesses may struggle to get approved for a merchant account from mainstream providers because they’re considered “high-risk”. If this is the case for your business, don’t be offended, it’s (probably) nothing personal. There are several criteria that the banks look at to assess risk. Let’s start with longevity. How long has your company been in existence? And what’s its track-record in terms of financial performance? Are there good years and then bad years, or is turnover pretty consistent? Have you or any of the other major players in the business gone bankrupt in the past? (If you fail on this criteria it’s entirely personal). You also need to think about whether your industry qualifies as ‘high-risk’ Gambling, travel and monthly subscription services are all sectors that fall into this category. So, what to do if your business is refused a merchant account? Don’t despair. Rates are a little higher, but there are plenty of providers out there which specialise in merchant accounts for high risk businesses. While most UK high street banks offer merchant account services, their fees are often significantly higher than payment providers. You’re best off comparing different independent companies to find a merchant account that fits the unique needs of your business. And, of course, one that doesn’t break the budget! Different merchant account providers have different pricing plans, focuses, and fee structures (in short, they’re different!) Fees depend on a number of factors. What types of cards do you want to accept? Will you have a minimum card charge? How many PDQ machines do you need? Monthly turnover for card payments – or forecasted turnover if you’re a start-up! Average transaction size – show me the money, honey! Your provider will help you through all this, and more. If you’re already raring to go and chat to one, just click on one of the icons below to get started or jump straight into our webform. You’ll get same-day quotes from up to four leading merchant service providers. Why does it matter which merchant account provider I choose? The provider you choose matters because of two reasons: fees and contracts. Merchant account fees vary. A lot. They can vary with the same provider from month to month, let alone from provider to provider. So it’s super important you weigh up all the options before signing a contract. Once you sign on the dotted line that’s it, they’ve got you. The average UK merchant account contract length is a whopping 18 months. And while early termination fees are rare, you most definitely will be required to pay any remaining rental costs. Card machine rental costs on average £20, so if you want out after six months (on an 18 month contract) it’ll cost you £240. Learn. Compare. And choose your merchant account wisely. How can I get a quote for my business? Easily – just take a minute to fill out our webform. Like accepting card payments, it’s quick, secure, and hassle-free. We’ll ask a couple of questions about your business. The goal? To match you with the best merchant account provider. It’s that simple. So save yourself some time trawling the internet and – most importantly – some cash, and get tailored quotes today. What is a UK Merchant Account? What is a Merchant Account Number?